Café Céleste tells the story of the intertwined lives of the inhabitants of a shabby Montparnasse apartment block above the eponymous bar. Among these characters are the ‘malodorous’ Mme Prêtre, the all seeing concierge who dreams of setting up her daughter as the lover of a rich man and living off the proceeds; Dr Fisher, an outwardly respectable abortionist, not above partaking of the drugs in his surgery; Socrates, the proprietor of Café Céleste, whose ill-advised largesse is ruining his business; and Jean Cabou, a mediocre painter. To this extent, the the book bears a superficial resemblance to Georges Perec’s later Life: A User’s Manual. But the novel gradually centres around the triangular relationship between Stéphane Morani, a mediocre musician in poor health; his wife Louise; and the shrewish shop-girl, Martine, with whom Stéphane enjoys a platonic relationship. Stéphane is handsome and charming, and since childhood has had the ability to please those around him through acting out the roles they (his parents, the priest, for example) wish him to assume. As a result he has become a fantasist, unable to distinguish between the reality of his life and the contents of the self-mythologising journal in which he scrupulously records his thoughts. The one act of rebellion of his life has been to defy his parents and marry Louise, an act he committed not out of love but from a misplaced desire to ‘save’ her from a life of prostitution. Oh, those stupid, ill-dressed, ill-fed women, crammed with cheap literature and meat, subsisting on the cheap cuts of life, and satisfied with their lot! But it was not so much their poverty she detested . . . [as] their vulgar and violent zest for life. This was another thing she detested: this narrow and colourful street that was always congested. She detested everything in it, the passers-by, the costermongers’ carts, the prostitutes, the neon lights, the shop and cafés. In this tumult . . . she walked alone . . . feeling conspicuous and scorned. Yet every day after work, Martine goes to the Brasserie Dorée to hear Stéphane’s trio finish their afternoon session (they are too mediocre to play in the evenings) and imagines that her relationship with Stéphane will one day amount to more than it presently does. To this extent, the novel could equally assume the (English) title of Mallet-Joris’ earlier novel, The House of Lies – each one of the characters exists in a world of self-delusion. A shrill, gay chatter arose, small groups of women had formed. Leaning against the columns, stretching their arms or rinsing each other’s hair . . . They were living intensely again. Three women grouped around that young girl, dragging a secret out of her and sharing it, laughing or groaning with the same vehemence, vigorously slapping their thighs (stout thighs, flabby thighs) . . .[ They] were women again and were recalling with rude words of the flesh the children born of their bodies, the men welcomed into their beds, the money counted by their tireless hands . . . And their lives were there, self-assured, rich even in vice, misery, sickness. Louise is like an older version of Alberte in The House of Lies – an island of stoicism and level-headedness amid a world deception and scheming. And like Alberte, the conclusion of the novel finds Louise returning to a previous existence, an existence in which she is contented and comfortable. She was not acting against Louise or against the man who was holding Louise in his arms. She had always known there was a world of this kind which she could never hope to enter, a world in which human beings embraced quite simply, slept and ate quite simply. The people of that world had never promised her anything. If she hated them, it was with an impersonal, cold, almost detached hatred. She had triumphed at last . . . She had seen his face distorted with rage and fear, stripped of all that pretended sweetness . . . And that face was as ugly as her own. She would unmask them all. From now on the world would be peopled solely with real faces, faces without beauty. The world would be nothing but ugliness. For all that Mallet-Joris holds up the delusions of her characters to ridicule, Martine is a monstrous creation, repellent in her desire to wreak havoc on the lives of those around her. Stéphane, for all his self-deception is a sympathetic character, undeserving of the fate that awaits him at the end of the book. 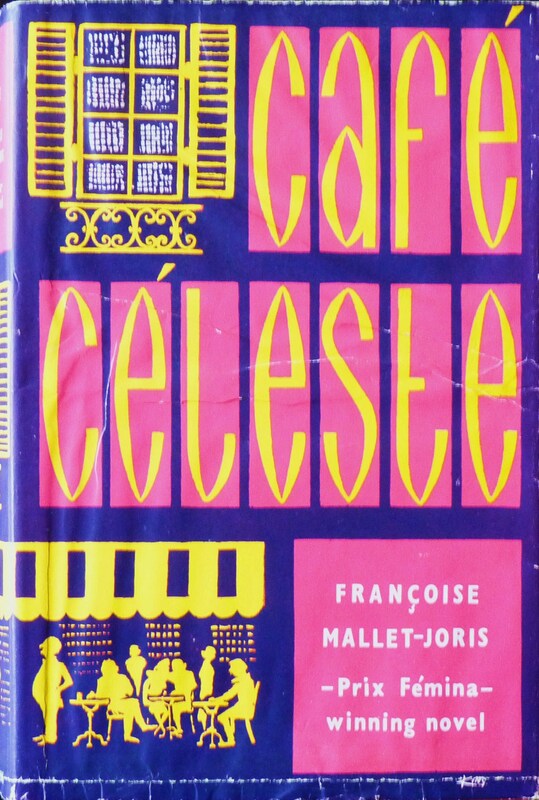 But, monstrous as Martine is, it is Mallet-Joris masterful evocation of character that makes Café Céleste so worth reading. Few novels contain such an array of characters, any one of whom could take centre stage in a novel of their own. Mallet-Joris’ exposition is leisurely. She is always happy to linger over the details of a street scene, café or theatre, and, at its best, her descriptive writing is rhythmic, evocative and rich. That said, her prose sometimes strains too hard for literary effect – there are quite often more adjectives than necessary, or a superfluous clause, which, in its attempt to hammer home the point, diminishes it. Similarly, Mallet-Joris’ is not frightened of taking her narrative off in what can seem a tangential direction. The novel meanders towards its conclusion, and it is hard not to think that were it more tightly focussed on the central relationships, it would have greater power. That said, it would be wrong to criticise the novel for being too complex, for resisting the idea that life is simple and linear. The lives of Mallet-Joris’ characters are messy and the novel should be applauded for reflecting this. First published in 1959 as L’Empire Céleste. Translated by Herma Briffault. W.H. Allen edition published 1959.